Info 3 *Driver CD NOT Included. 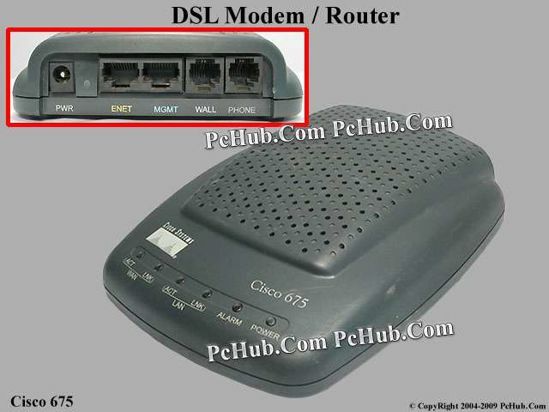 - This Cisco 675 is an Asymmetric Digital Subscriber Line (ADSL) modem for home connectivity to an ADSL service provider network over an ADSL/Asynchronous Transfer Mode (ATM) physical layer. - The Cisco 675 receives adaptive rates up to 7 Mbps downstream and transmits 1 Mbps upstream. - A 10/100Base-T interface is provided for connection to a Ethernet LAN or Ethernet-equipped PC. - The Cisco 675 supports Cisco Quick Dial technology for ADSL bandwidth-on-demand. - AC Power Adapter (5V 15Aand Driver CD NOT Included.